Need to fix a bug, add a feature, or support an application 24/7? Our top-tier developers and infrastructure talent provide managed services and support for custom applications. You won't find an exhaustive list of what we will or won't do. 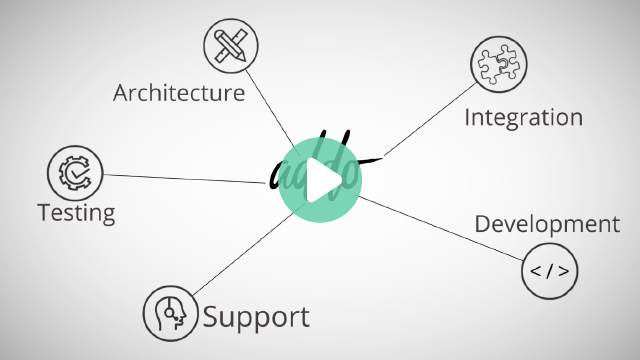 It's simple — if your request involves our supported technologies, we have you covered. Let our team help yours deliver something great. Whether you need proactive management of your application and its underlying infrastructure, or you simply want a company on call if something ever goes wrong, we're here to help. With our service, you'll only pay for what you need. Maintaining systems for continuous integration and continuous delivery can be time consuming. Our managed DevOps service helps streamline releases and support quality deployments, leaving your team free to focus on development. It can be tough to meet aggressive timelines and manage fluctuating demand. We provide on-demand development capacity to help our managed services and DevOps clients tackle acute issues and add velocity to their sprints. With a guaranteed response SLA, you’ll know when our team has received and is reviewing your request. We designed our service for those getting things done. Skip the multi-week sales process—get a quote, today. Billing hourly lets us accept almost any request. Integrations, migrations, short-term or long-term support—we’re here to handle it all. Submit as few or as many requests as you wish each month. Limit spending or hit pause at any time. We know it takes a team to deliver something great, and our platform is built to keep your team and ours in sync. Our people are core to what we do. We work hard to find and retain the best in the industry who share our passion for service. From redundant systems to comprehensive liability and cyber insurance, we’ll be here when you need us most. Our systems are designed and our people are trained to keep your data secure and confidential. “It feels good to have a team supporting us, and we no longer have issues tackling new demands from the business." to help them drive progress and sustain momentum. Brian's primary responsibilities include managing Addo's overall direction and growth. He has over 17 years of industry experience, including roles with the U.S. Air Force and most recently as CIO/CTO of a healthcare company. With backgrounds in engineering and IxD, Nick is responsible for managing Addo’s service delivery systems. In prior industry roles, he’s served as principal consultant, service delivery manager, and sales operations manager. Responsible for ensuring the quality of the development work we complete, Jeremy's experience with fast-burn startups and full stack development gives him an edge in understanding how to deploy quality solutions, quickly.